StreetMusicMap: a global coverage on street music StreetMusicMap on Google Maps: https://goo.gl/8dyBf6 Map of Street Music Festivals: https://goo.gl/Y1krZF Instagram: www.instagram.com/streetmusicmap Podcast: www.soundcloud.com/streetmusicmap Facebook: https://www.facebook.com/streetmusicmap/ Site: http://streetmusicmap.com/ Mixcloud: https://www.mixcloud.com/StreetMusicMap/ Spotify: https://open.spotify.com/user/streetmusicmap It was in the beginning of 2014 (late January) when i created a project about street musicians on Instagram. But my first insight came around in August 2013, in the streets of Kiev, Ukraine: during that personal trip, I recorded a short video of a musician and posted it on my personal Instagram profile. He was playing a string instrument I had never seen called bandura. I was going to take a picture, but Instagram had just released its 15-seconds video format. I made the recording and realized that 15 seconds was an interesting length for a narrative. After that trip, I moved to São Paulo for professional reasons (I was living in Porto Alegre before), where I began to record street musicians that I encountered on the way home. I spent a lot of time at the Consolação subway station, where several buskers play. I started recording and putting the music videos on my personal Instagram account. Then I created a series, with the hashtag #streetmicrodocs. A great friend of mine, called Max Laux, gave me a single and important tip: ?Why don?t you turn this street music series of yours into an Instagram account??. 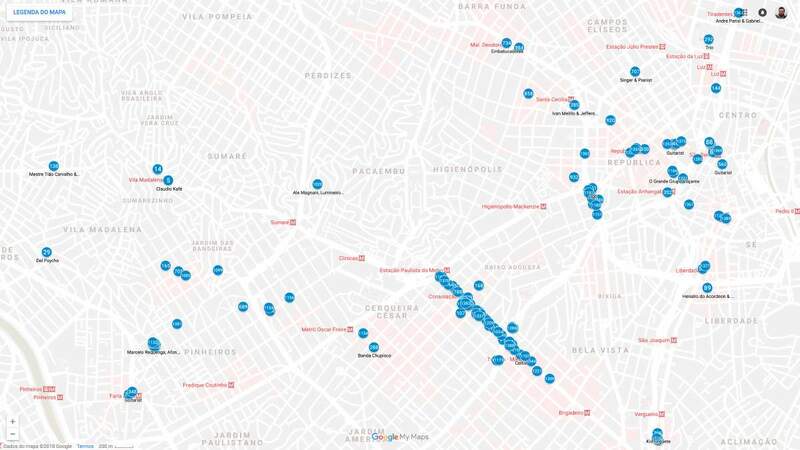 Months later, during a free consultation from the Brazilian Startups' Association (ABStartups), I changed the name of the project to StreetMusicMap. Later, Instagram increased the video length to 1 minute, which was very important for the project. In the last 4 years, StreetMusicMap became a multimedia project: a collaborative listing of street music performers from all over the world. It has more than 1,350 artists documented on videos in 97 countries, filmed by more than 700 collaborators, and up to 41,000 followers on Instagram. 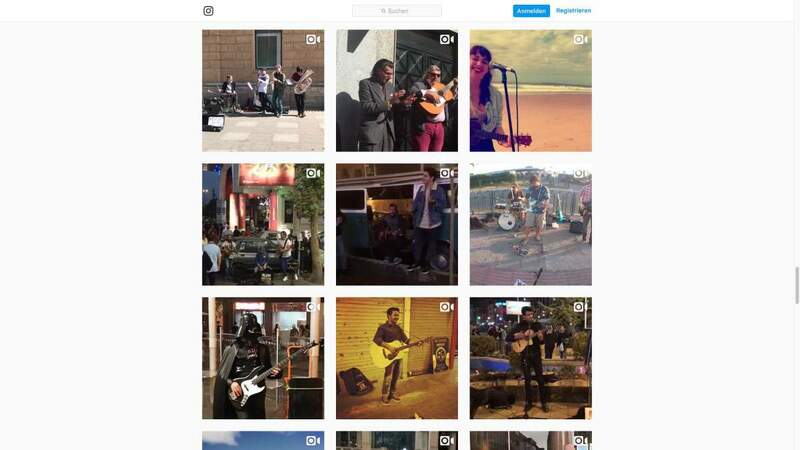 StreetMusicMap Instagram won Silver at the 2017 W³ Awards (Content & Marketing-Social Video for Social category) and it is a two-time Webby Award Nominee (Social?? ?Music category in 2017 and 2018), chosen by the International Academy of Digital Arts & Sciences as the top 5 in its category in the world. 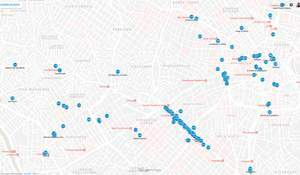 The StreetMusicMap itself is being developed to share full info about the artists. A live album with street bands from São Paulo, Brazil, was released in 2016: StreetMusicMap Vol. 1 - Live at O.bra Festival (Loop Discos). StreetMusicMap Radio is the new podcast launched in 2017. It is also the first project to curate street musicians on Spotify, creating global playlists featuring the best buskers in the world. The research has been shared by important media companies, such as BBC, The Guardian, CityLab, HuffPost, Atlas Obscura, AdWeek, WFMU Radio, Instagram (Music Department), and universities: University of Texas at Austin (Journalism in the Americas), CUNY Graduate School of Journalism, University of Toronto, The New School, Newcastle University (UK) and Monash University (Melbourne, Australia). B.B. King, Édith Piaf, Eric Clapton, Jay-Z: all these big names started out on the street, where there are a lot of good people doing it, but we rush so much these days that we do not even pay attention to the things around us. I consider myself a reporter no matter the name of my job, because I always try to tell a story, when I?m producing, writing or recording. I always try to give credit to the artist and to the person who made the recording. In the beginning, I was a purist and did not post without the musician?s name. But over time, I realized that the platform became a channel for promotion, because many anonymous artists were being identified in the comments. This was the case of a video of a Russian harpist playing in Red Square in Moscow. The recording was posted without her name, and minutes later, the artist identified herself in the comments: ? :D wow! It?s me!? In another case, a social worker in the Democratic Republic of Congo sent a message to me thanking for the sequence of videos published with African musicians. She said she was able to explain to deaf-mute students the different cultures of the African continent just with the musicians? body language. For Instagram, the charm is that the video gives you the sensation of traveling the world. That?s why I like raw videos with little production. There?s the dog barking, the car passing, and the immediate audience reaction. That sound of the street is the differential, you feel like a witness. SHORT BIO: Daniel Bacchieri is a journalist, film director, multimedia producer and music curator. Founder and curator of StreetMusicMap, a global coverage on street music. 2017 Fellow at the Tow-Knight Center for Entrepreneurial Journalism (CUNY - The City University of New York), 2018 & 2017 Webby Award Nominee , 2017 The W³ Awards Silver Winner (StreetMusicMap Instagram) and NYC Media Lab '17 Participant. His most recent works are focused on documentaries and branded content, produced by and for NBA Entertainment, Instagram & HardPin Media (NYC), VICE Brazil, Zeppelin Filmes (Brazil), Coca-Cola, Toyota, Sony, Diageo. Born in the city of Rio Grande, Brazil, and nowadays based in São Paulo.